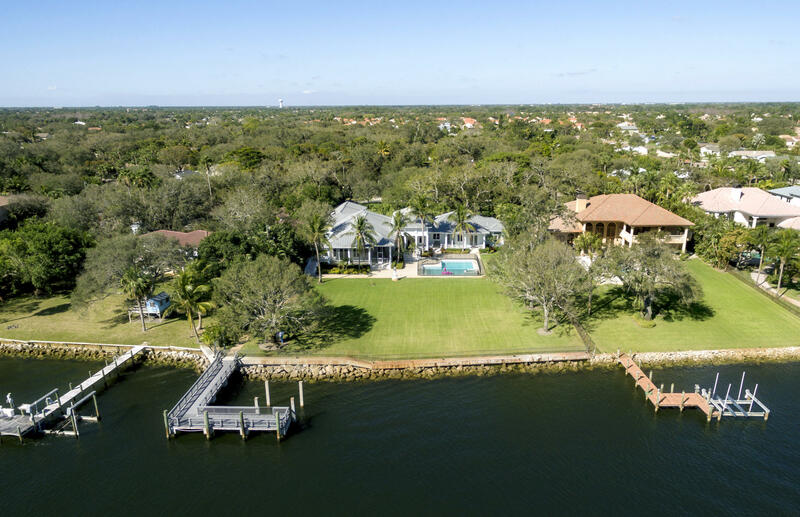 This custom built and impeccably designed estate home is on 1.13 acres located directly on the Intracoastal Waterway. The manicured front lawn features large Oak and Banyan trees and a 4 car garage with a Key West inspired metal roof. A large entrance Foyer has a vaulted ceiling and gas fireplace and is a perfect spot for your holiday decorations. The water views from almost every room in the home are truly spectacular especially from the kitchen and family room which feature tall hurricane impact windows, high end appliances including a Wolf gas range (a high performance cooking range with precise control) a wine cooler with an ice maker and maximum cabinet space with additional large pantry space. From the formal dining area are large water views looking out over the massive back yard. Waterfront: Intracoastal, No Fixed Bridges, Ocean Access, Seawall Yes 150 Ft.